The Prettiest Beans in My Garden! This spring Mary, from Mary’s Heirloom Seeds, sent me a variety of heirloom seed packets to plant in my garden. Read my reviews of Pink Oxheart tomatoes and Royalty Purple Podded Beans!! One of those packets contained 45 seeds of Royalty Purple Podded Beans and I was looking forward to taste testing these pretty legumes. The seeds were planted next to a row of yellow wax beans and a row of green beans. Now all three rows of beans are bearing and I’m so happy to have such a nice selection of beans. But I have to tell you, the prettiest beans in the garden are definitely the Royalty Purple Podded Beans! If you have never tried homegrown green beans, you don’t know what you’re missing. They taste so much better than anything canned, frozen, or shipped across the country in plastic bags. We enjoy fresh beans right off the plant so much that I’m willing to go out and pick them at 6:30 in the morning to beat the worst of the heat wave. It’s well worth the effort and the sweat (yes, I was soaked with sweat even at 6:30am!). I’ve grown quite a few different varieties of beans over the years and they all tasted great, and most of them produced well too. I have grown some purple podded beans and loved them, so I was pretty sure I would like the Royalty Purple Podded Beans from Mary’s Heirloom Seeds. But I’m not sure that I’ve ever grown three varieties side by side and compared them in the past. The Royalty Beans began producing several days before the yellow wax beans, and the green beans are just starting to catch up now. I like having the season extended with varieties that have early, middle, and late maturity dates. It gives me a chance to serve fresh beans before the bounty really begins, then I can start preserving the extras as they become more plentiful. The later varieties extend our enjoyment of fresh beans into the late summer. The two things I noticed that really set the Royalty Purple Podded Beans apart from the other two varieties is the gorgeous color (the color changes to green when cooked) and the disease resistance. Both the yellow wax and the green beans are having issues with a fungal infection that is turning leaves brown and causing the stems to rot. It isn’t infecting all of the plants and I’m still getting plenty of beans from them. But the Royalty beans aren’t affected by this disease in the least! They are going gangbusters with clusters of 3 to 5 beans ready to harvest all from the same plant. I hope they continue to bear heavily so that I can keep harvesting the pretty purple beans. I blanched beans and froze them the other day and I know we’ll have more to put up as the plants continue to produce. I’d like to dehydrate some this year too. Hopefully I’ll have a lot more beans than last year, when I relied too heavily on the Scarlet Runner Beans that didn’t produce very well. I still managed to pressure can more beans than we could eat over the winter, so I doubt that I’ll can many this summer. You can also let some of your beans mature on the plant for dried beans. It’s an easy way to store the bounty of your bean patch! I plan to leave some of the Royalty Purple Podded Beans to mature and dry on the plants for next year. Once the pods turn papery brown you can pick the beans, shell them from the pods, and allow them to dry thoroughly on a screen. When they are completely dry, store them in a cool dry place for the winter to plant the following year. For more information on saving seeds, read my post Seeds for Self Sufficiency. I received heritage seeds from Mary’s Heirloom Seeds to review for free. 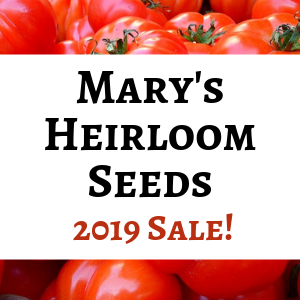 In addition, this site is a participant in Mary’s Heirloom Seed Affiliate Program, an affiliate advertising program designed to provide a means for me to earn store credit by linking to Azure Standard. You will not pay any extra for your purchase and I will earn a small commission to help fund this website. That cupboard is absolutely perfectly gorgeous in every way! There’s just something about a pantry full of home canned fruits, veggies and such!!! Thank you for the renewed inspiration!